HomeBLOGFree CME Courses Available Now! Free CME Courses Available Now! Did you know that CDC’s Act Against AIDS (AAA) campaigns offer free continuing medical education opportunities (CMEs) for clinicians? AAA is currently featuring three new web-based courses. 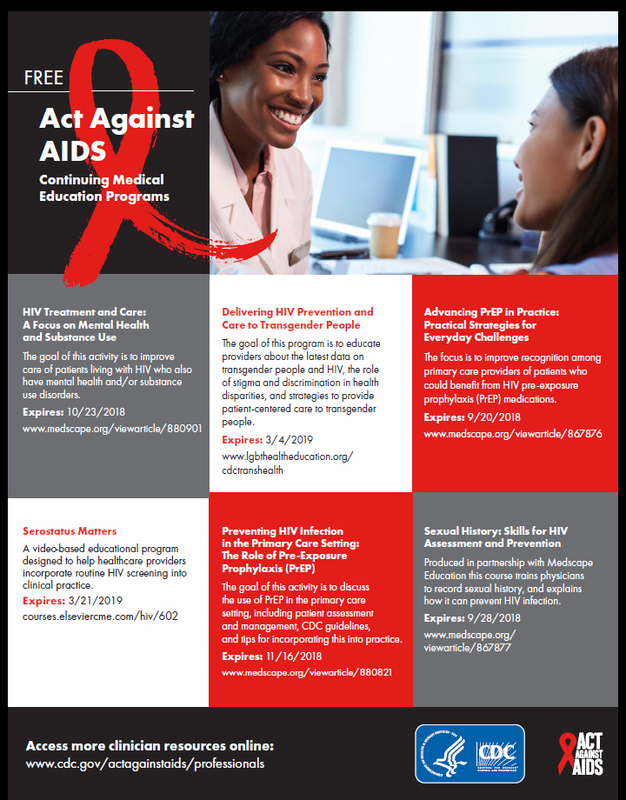 If you’re interested in prescribing pre-exposure prophylaxis (PrEP), improving care and prevention for your transgender patients, screening patients with HIV for mental health and substance use issues—or all three, AAA has a course for you! Busy schedule? No problem. You can take each one at your convenience! Read on to learn more about the three new courses and register. This CME course is for primary care physicians, ID/HIV specialists, public health and preventive medicine specialists. The goal of this activity is to improve recognition among primary care providers of patients who could benefit from HIV PrEP medications. This course expires 9/20/2018. Register now. This free web-based CME/CEU program addresses ways health care providers can serve transgender people who are at high risk to help prevent HIV, improve care for transgender people living with HIV, and incorporate strategies to make clinical environments more welcoming to transgender patients. The program presents the latest data on transgender people and HIV, describes the roles stigma and discrimination play in contributing to health disparities, and provides tips on how to provide patient-centered care specific to transgender people. This course expires 3/4/2019. Register now. This web-based CME program from CDC and Medscape Education discusses the impact that mental health and substance use disorders can have on HIV treatment and care. This CME activity demonstrates how HIV care providers can screen patients for mental health and substance use issues, address factors related to these disorders, and help patients adhere to HIV treatment and remain in care. This course expires 10/23/2018. Register now. Learn more about AAA’s campaigns for healthcare providers.